Brothers Nik Mohd Hazri, Nik Mohd Shazmie and Nik Mohd Shahfiz. 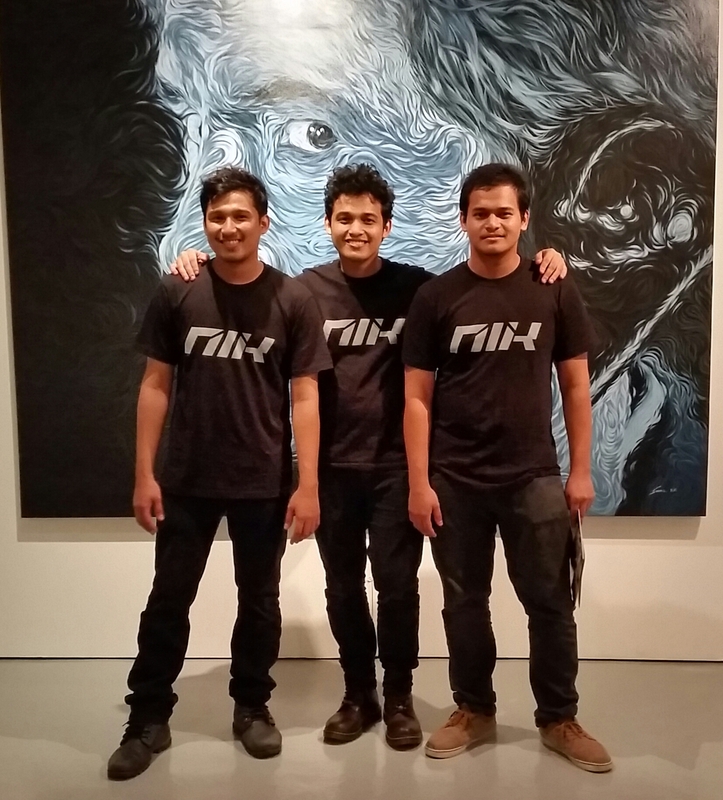 Graduates from UiTM, the leading art institution of the country, Nik Mohd Hazri, Nik Mohd Shazmie and Nik Mohd Shahfiz are steadily making their mark in the local art scene with their skillfully rendered figurative works on themes ranging from the serious, humorous to the bizarre. Each with his own style and strength, the Nik brothers are truly distinct in character, while similarly passionate about using their artistic talents in conveying their message of current times. The show welcomed visitors with a resounding showcase by Nik Hazri, whose hyper realistic paintings of his long time muse plays a central role in his theme – family. This emotional portrayal tells the stories of those who have lost their loved ones in the tragic MH370 incident. The open-ended circumstance leaves families still yearning for answers, whilst the rest of the world continues on with their daily lives. Nik Hazri’s portrayal of strength amidst the loneliness is powerful, bringing out the emotions through the subtle hints of the tragedy, whether through the glaze in the subject’s eyes, the hints of the national carrier’s symbolic colours, or the floating dove feathers representing hope and peace (in one’s soul). 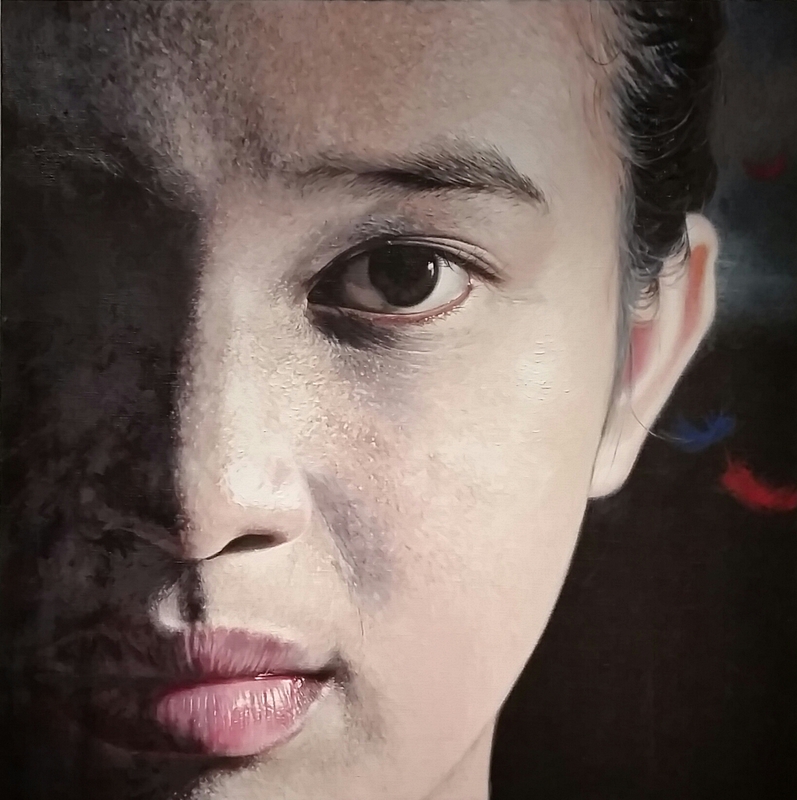 Internalising this distant tragedy, Nik Hazri connects with his theme by drawing inspiration from his family, in particular his sister as his muse. Nik Mohd Shahfiz brings his fascination with characters in thrillers onto the canvas, sharing his point of view about the complexities of the movies. In “How are you, mother?” Norman Bates is on the phone presumably making a phone call to his mother – or not? With his skillful rendition of the scene, Nik Shahfiz poses the question of dubiousness, of suspicion – are things really what we portray them to be? In each interpretation, from Edward Scissorhands to Hannibal Lector, the complexity, confusion and uncertainty is represented by clear but soft swirls in the subjects – adding gentleness to the harsh characters that is played out in the movie storyline. 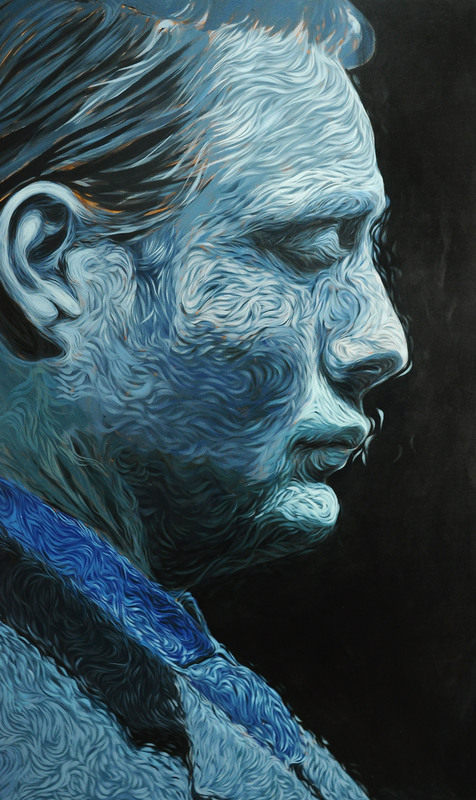 Nik Shahfiz adds that, the choice to apply swirls to the subject itself in creating the image represented the complexity of the men that was being studied. Interestingly the series is made up of a paradoxical approach – of soft and cool tones and snapshots of the harsh characters in less intimidating positions, adding further a sense of eerieness to what really goes on in their minds despite the aggressive exterior. Nik Shahfiz’s perception of these personalities are forgiving and renders a psychological review and analyis of their representation in the characters presented to viewers. The walk-through of the exhibition ends (or begins with – depending on where your starting point is), with an intense comical portrayal of life – that of Nik Mohd Shazmie’s. 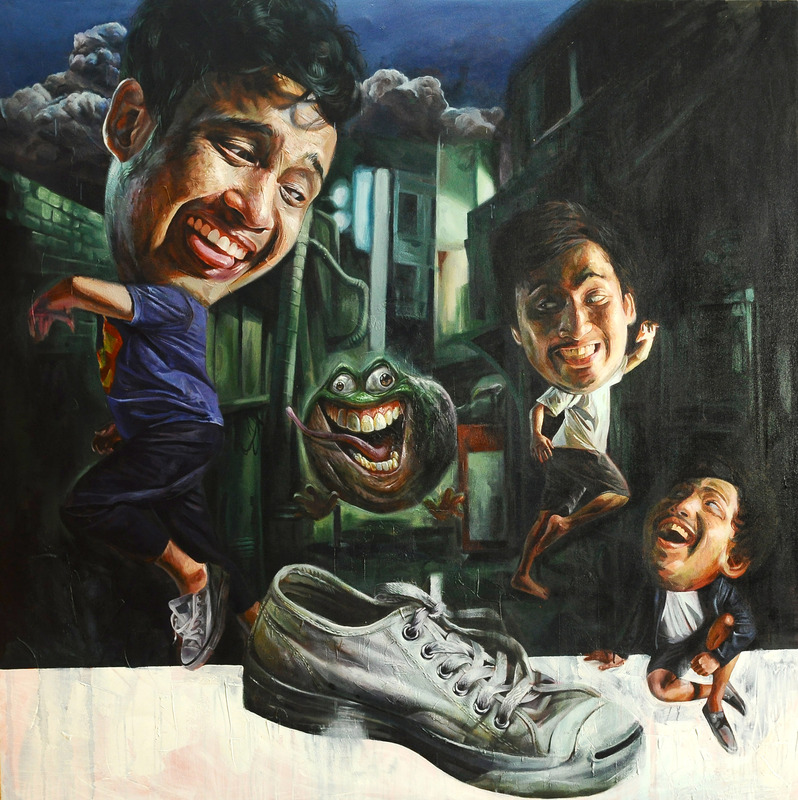 Bringing his life experiences onto canvas, this talented artist also injects comical relief into his works. Betrayal, love, friendship and day to day encounters that brings colour to our lives if shared with the audience. One of our favourites from this series is the ever feared incidence of stumbling upon a frog leaping out of your shoe when you least expect it! In creating a comical perspective to all situations serious and hilarious, Nik Shazmie’s use of dynamic colours, exaggerated expressions and out of proportion perspective accentuates the humour in his message of each painting. A bright future lies ahead for the Nik Bros, with future off shore exhibitions in the works. We look forward to more interesting from works from these three emerging artists. The exhibition was held from the 18th April – 2nd May 2015, marking another successful run by the G13 Gallery. Posted on May 1, 2015 February 21, 2017 by ChalkandRaddyPosted in Visual ArtTagged Chalk and Raddy, G13 Gallery, Malaysia Artist, Malaysia Emerging Artist, Nik Bros, Nik Mohd Hazri, Nik Mohd Shahfiz, Nik Mohd Shazmie.